This is the story about an author (Bissinger) and his book (“After Friday Night Lights”) and what happened to him when he got caught up in the Book Wars (Byliner Takes Bissinger’s E-Book Off Amazon – NYTimes.com). Alot of people who love to read and love to write books will be dismayed by this and think: this can’t be happening. But it is, and it will get worse. 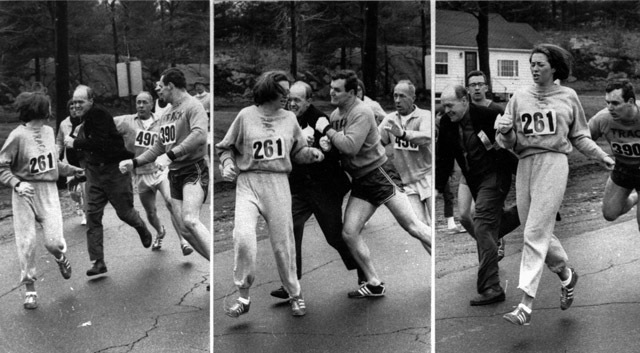 It’s hard to believe, but 45 Years Ago, An Enraged Boston Marathon Race Director Attacked A Female Runner because women were not allowed to run the Boston Marathon. It wasn’t until a few years later did events allow and encourage women, and Switzer eventually won the 1974 New York City Marathon in 3 hours, 7 minutes. Now of course, women are great marathon competitors and women fill the ranks of any marathon event. This great photo sequence is the race director trying to remove Switzer from the race, only to have Switzer’s boyfriend knock him away! The one thing you need to be happy is…. …quite simple, according to this: What do very happy people all have in common?. Turns out, there was one—and only one—characteristic that distinguished the happiest 10 percent from everybody else: the strength of their social relationships. In other words, you need friends! This is not surprising, of course, but it is nice to see the data. Go read the article for more on this. In the wonderful children’s book series, Poppleton, there is a story about how the main character wants to live to be a 100. He learns from a wise old mouse that the secret to a long life is friends. Looks like it is the secret to happiness too. After all, the two go hand in hand. And if you want a great series of books to read to kids, go see Poppleton And Friends by Cynthia Rylant , among others. I thought wall decals had come and gone, but after seeing the ones at Blik, I want more walls in my house just to have the chance to use some of the great ones that they have, like Asteroids! There are dozens of great ones there. Check them out.